Bhutan shrouded behind the mystical aura and legends is the last Himalayan Kingdom. There are lot of places to visit in Bhutan. 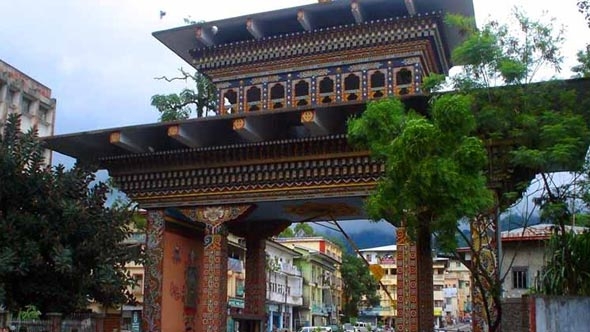 In Bhutan Holiday's 4 Nights and 5 Days Tour Package you will experience extraordinary journey of exploring the capital city of Thimphu and ancient town of Paro. Get the zest of indigenous culture and cuisine of Bhutan during your Bhutan Holidays in the Southern Bhutanese Border Town of Phuentsholing. Next we will take you to Thimphu, the capital city of Bhutan. Here we will visit the grandiose Trashichhoe Dzong, National Textile Museum, Memorial Chorten and witness the tallest statue of Sakyamuni Buddha above Kuensal Phodrang Nature Park. Later you will be transferred to Paro. This regal town is best known for the Cliffside Monastery Taktsang also known as the Tiger's Nest. All these destinations and activities in our 4 Nights 5 Days Bhutan holiday Tour Package are carefully selected by Bhutan Holidays expert to let you get the best of Bhutan in 5 Days. Bhutan Tour Package Special Tips - About Phuentsholing: In 1976 Amo Chhu crocodile breeding centre was built. It was started with only twelve crocodiles. Now Amo Chhu crocodile breeding also has been helping in the rising of tourism of Phuentsholing. Here tourists will find two species of crocodile, Gharials and Muggers. Both these species are listed under the list of critically endangered species by IUCN. Wake up early and after breakfast check out from your hotel and start your excursion in Thimphu. The first place to visit is the Memorial Chorten which was built to commemorate the memory of 3rd Drukpa Gyalpo. Memorial Chorten is situated in the heart of Thimphu. You will find many devotees near the chorten. Enjoy the serene ambiance for some time. Now we will proceed to Mothitang Takin Preserve. The preserve is the home of takin which is national animal of Bhutan. Morning is the best time to visit as takin comes near the fences to eat their food. This unique animal has hyped the interest of many animal lovers. Near takin Preserve there is the BBS Tower from where you will get a panoramic view of Thimphu City. Our next destination is National Textile Museum. Here you may learn to wear Gho and Kera while finding out the difference between royal dress and ordinary dress. Post lunch we will drive to the famous Thimphu Dzong situated along the river banks of Wang Chhu. Thimphu Dzong is also known as Trashichhoe Dzong with its grandiose architecture and ancient artefacts. After adorning the colourful Thangkhas and painting let us proceed to Kuensal Phodrang Nature Park to witness the magnificent statue of Sakyamuni Buddha also known as Buddha Dordenma, the Buddha View Point has become the iconic landmark of Thimphu. After the sightseeing is over we will proceed to Paro. The journey between Thimphu to Paro will take approx 2 hrs. Check in your hotel in Paro and rest for the night. Overnight stay at Paro.